Summary: We wait together, people of all ages, fearful because Jesus has gone. We are to wait for something he has promised. Suddenly there is a noise like a wind, then something hot and blazing. We feel ourselves change; something new is happening. Words fall like raindrops, like drumbeats. The Holy Spirit has arrived! We hear many languages. We feel different. Then Peter begins to speak. “Jesus has given us a wonderful gift. We are called to something new. God is changing us so that we can see old things in a new way.” We all listen as Peter tells us again about Jesus, his life, death and resurrection. We hear and the Holy Spirit changes us. Rivers of baptism flow. We become a new family, sharing, breaking bread together, worshiping God. This is the day of Pentecost when Church was born. Literary elements at work in the story: The story of Pentecost is so familiar that a summary is not necessary. This, however, is a first person narrative which invites us to be participants. This is a more comprehensive telling of Acts 2 than is usual for children. It includes Joel’s prophesy, (without identifying it), Peter’s sermon, a reference to baptism, and the shared life of the new community as well as the gift of the Spirit and varied languages. Some of the story is omitted but the essential outline of Pentecost is here, enriched by metaphors and highlighted by feelings. The story is told in simple, direct sentences with print variation and color contributing to the excitement. But without pictures or print, it’s easy to hear this story as an aural experience. The art adds details about this being an intergenerational group and animals are present. The author makes a number of suggestions about how to celebrate Pentecost on the concluding page. How does the perspective on gender/race/culture/economics/ability make a difference to the story? The illustrations show the inclusive nature of the church. Theological Conversation Partners: Pentecost is relatively free from the cultural takeover of Christmas and Easter. It offers a wonderful opportunity to celebrate as the Church and this book may help with the celebration. Here are three questions to consider: Is a birthday cake the best expression of what’s happening in Acts? What’s beginning here? Peter’s sermon indicates fulfillment as well as newness. Calvin says that the church began with Abraham, rooted in 2,000 years of salvation history. Perhaps “seeing old things in new ways” leaves the door open for future growth in theological understanding but “birthday” tends to make the church begin in Acts. This may be more theological freight than a children’s book should bear but good Bible story books don’t hamper future understanding. Second, where is the word “witness?” Equipping the church to witness seems to have been the reason for the gift of the Spirit in this particular way at this particular time. (Act1 1:8) and it’s a good word for children to acquire. Finally, what is accomplished by dropping the definite article before Church? And why not drop it before Holy Spirit as well? Perhaps some explanation could have been included in the excellent note for parents at the end of the book. Find the story in the book of Acts, Chapter 2. The Holy Spirit helps people remember stories of Jesus. Find some pictures of some of the things Jesus did. What are other things the Spirit does for people of the church? Why is baptism included in the story of the church? Find some pictures in the book of things you would find in your church today. What are some of the feelings the Church experienced on Pentecost? Why do you think the author said, “we were all together?” Were you there? Is this part of your story? What did the followers of Jesus know on Pentecost that they had not known before? Someone told this story to others so that you have heard it today. Can you tell this story to someone? This review was written by regular reviewer Virginia Thomas. DISCLOSURE: STORYPATH RECEIVED A FREE COPY OF THIS BOOK FROM THE AUTHOR IN EXCHANGE FOR CONSIDERING WRITING A REVIEW ON THE BLOG. 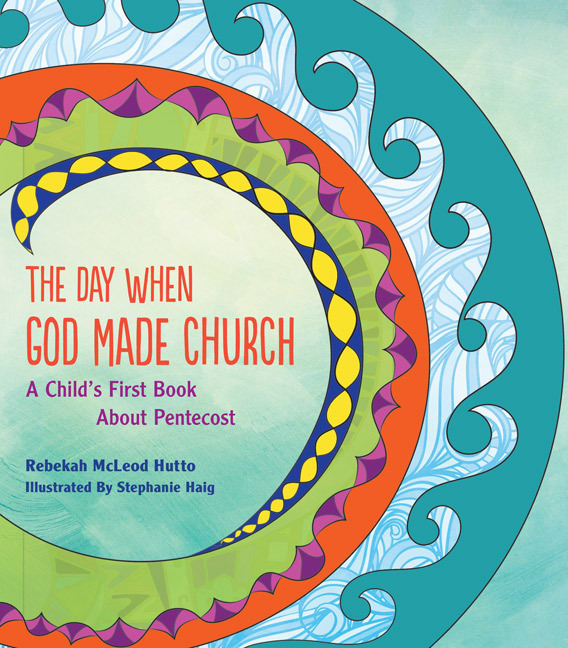 The Day When God Made Church: A Child’s Book about Pentecost by Storypath is licensed under a Creative Commons Attribution-NonCommercial 4.0 International License.